Studying in Birmingham means you can tap into a vibrant media hub. Our range of media-orientated guest lectures allows you to learn from practitioners. Students are able to interact with media professionals via our long-established 'Creative Networks' forum. Creative Networks is about bringing together all parties involved in screen-based and sound media in the West Midlands. The events increase knowledge sharing and the use of innovative technologies, creative practice and business processes. 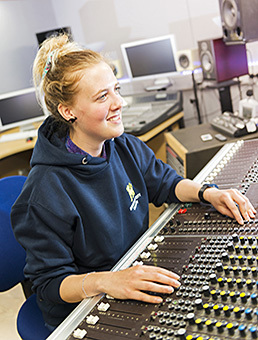 Established links with local companies such as live sound specialists Cloud One and SSE Audio Group mean that our students have opportunities to get hands-on work experience. Birmingham is becoming a popular location for film makers. In 2016, Steven Spielberg came to Birmingham to film ‘Ready Player One’. The city was also used as a location for ‘Kingsman: The Golden Circle’ and Ray Winstone film ‘Jawbone’. The BBC Academy, the BBC’s centre for in-house and industry wide training, moved to the city in 2015 and works with local companies to increase the talent base in Birmingham and the West Midlands. Birmingham has one of Britain’s best performing digital economies, with nearly 37,00 people employed in the sector which delivers £1.13bn to the regional economy. Employment in the digital sector in Birmingham increased by 15 per cent in 2011-14. More and more digital firms are attracted to the region because commercial property prices come at a third of the cost of London property.